When I was growing up, we didn’t watch home movies. We watched slide shows. My parents had boxes of photo slides: from their time in Chile; from the time my brother and I were babies and even from my mother’s college days At least I think there were slides from my mom’s college days. All I remember was a photo of a Volkswagen Bug with a cracked front window sitting in a ditch. My mom kept that slide because it was a memory of her first car and her first car accident. To me, it represented something else entirely: my mom, the most practical woman I knew, had owned a slug bug. That was actually cool. When I was growing up, our name for Volkswagen Beetles was slug bugs. Whoever saw a slug bug first had permission to slug another person in the arm. The terminology might have changed since I was a child, but not much else had. The Volkswagen tradition made me smile. 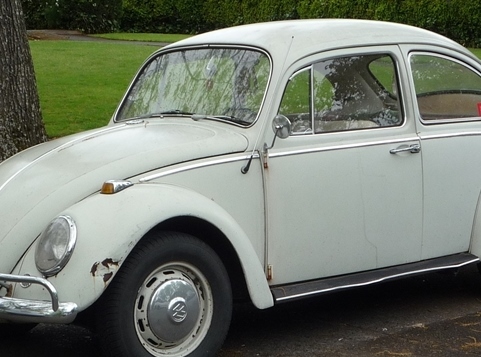 Posted on February 5, 2014, in Family, My life, perspective and tagged 365 reasons to smile, cars, childhood, culture, memories, musigs, smiles, Thoughts, traditions, Volkswagen beetle. Bookmark the permalink. 24 Comments. Ah, yes – slide shows! We would pop popcorn and get juice and then settle in to watch the show. Great memories!!! We always begged for the ones when I was a baby eating ice cream, We called them the monkey slides, I guess I looked like a monkey. Interesting photo. Your mom’s bug was dark green and did land in a ditch beside the curve on an icy road, missing the road sign and the fence, and damaging only the front bumper. The car went to your uncle when Mom went to Chile and then to your grandparents. It was totaled on a nasty rainy day when a larger car came across the center line and plowed into it. Grandpa was driving. His eye glasses broke. Nothing worse. The car body then became a dune buggy – we know because of a letter that came due to some kind of mix-up on ownership or insurance, forgotten which. It was also the only car on which your mom changed a tire – on a little traveled northern Michigan highway. Opened the instruction book, did step one, read step two, followed it, etc. Just as she finished a motorist stopped, asked if there was a problem, checked that the nuts were tight enough, and we both went merrily on our ways.